This article was originally published on the feast of St Lawrence five years ago. I have made a number of small changes and corrected a small factual error. Since the earliest times, St Lawrence has been venerated as a patron Saint of the city of Rome, along with Ss Peter and Paul, and his feast day has always been one of the most important in the ecclesiastical year. A remarkable number of Roman churches are dedicated to him, several more, in fact, than are dedicated to either of the Apostolic founders of the Church in the Eternal City. Among them are the Patriarchal Basilica of St Lawrence outside-the-Walls, where he is buried, and three of the most ancient parishes in the historical center of the city: San Lorenzo in Panisperna, (the reputed site of his martyrdom), San Lorenzo in Lucina, and San Lorenzo in Damaso. These four churches are frequently found on the list of station churches from Septuagesima Sunday to Low Sunday, in proximity to stational observances in honor of Ss Peter and Paul. San Lorenzo in Miranda was one of the first major churches to be built in the heart of the ancient city’s political and religious life, the Roman Forum; it sits within the portico of the temple of the divinized Emperor Antoninus Pius and his wife Faustina, on the steps of which the great martyr was said to have been tried and condemned. The Basilica of Saint Lawrence outside-the-Walls, in an eighteenth century engraving by Giuseppe Vasi. Two private chapels of the Popes are also dedicated to him, San Lorenzo ‘in Palatio’ at the Lateran, and the Niccoline Chapel at the Vatican. The former was built in the mid-8th century, and after various restorations and embellishments, became a Papal chapel about three centuries later; rebuilt by Nicholas III (1277-80), it now survives only in part within a building known as the Scala Sancta, across the street from the Pope’s cathedral. The chapel’s nickname ‘Sancta Sanctorum – the Holy of Holies’, does not come from its status as a Papal chapel, but from the amazing collection of relics formerly kept therein: among them, a piece of the grill on which St Lawrence was roasted alive, and some parts of his body. In the 330-year period from 1048 to 1378, the Popes spent roughly 250 years outside of Rome; after so long a period of neglect and partial abandonment, and two massive fires in the 14th century, most of the vast complex of buildings around the Lateran was in no state to be lived in. The Popes therefore took up residence at the Vatican, and have been there ever since. In 1447, Nicholas V built a new chapel within the Vatican, and commissioned the Dominican painter Fra Angelico to paint the walls with stories of the two deacon martyrs, St Stephen and St Lawrence, to whom the chapel is jointly dedicated. 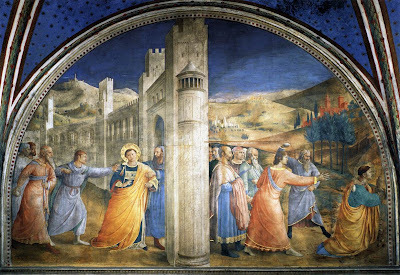 The Martyrdom of Saint Stephen, on the left wall of the Chapel of Nicholas V, by Fra Angelico. The martyrdom of Saint Lawrence is directly beneath it, but the part that shows Lawrence on the grill in the lower right hand corner is ruined. The association of Ss Stephen and Lawrence, naturally suggested by the parallels between their lives and deaths, figures prominently in art and liturgy in Rome. Both were deacons under the authority of the Pope in their respective cities, Stephen in Jerusalem under St Peter, and Lawrence in Rome under St Sixtus II, the most venerated of the early popes martyred after Peter. Both were put in charge of the Church’s charitable activities by the Popes whom they served, and both were eloquent preachers of the Christian faith. Both suffered terrible martyrdoms, Stephen by stoning, as recounted in the Acts of the Apostles, while Lawrence was roasted alive. In the office of St. Stephen, the third antiphon of Lauds (partially quoting Psalm 62, with which it is sung), reads “Adhaesit anima mea post te, quia caro mea lapidata est pro te, Deus meus. – My soul hath stuck close to Thee, because my flesh was stoned for Thy sake, my God.” In the office of St. Lawrence, this same antiphon is changed to “Adhaesit anima mea post te, quia caro mea igne cremata est pro te, Deus meus. – My soul hath stuck close to Thee, because my flesh was burnt for Thy sake, my God.” The artistic pairing of the two done so beautifully by Fra Angelico is also found twice in the Sancta Sanctorum which the Niccoline Chapel replaced, in the mosaics over the altar and in the frescoes that adorn its walls. 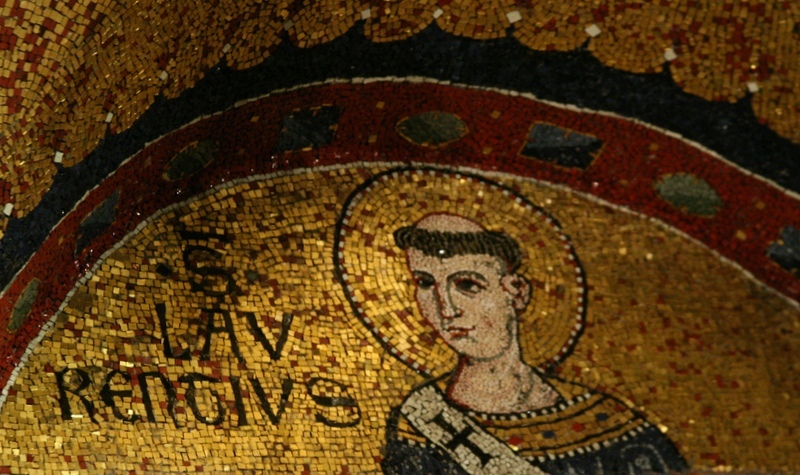 Saint Lawrence in the 11th century mosaics over the altar of the Sancta Sanctorum. 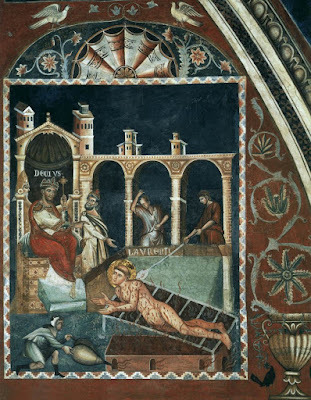 The martyrdom of Saint Lawrence in the late 13th-century frescoes on the walls of the Sancta Sanctorum. The Emperor Decius appears on the left; the medieval accounts of St. Lawrence usually place his death in the persecution of Decius in 250-51, rather than that of Valerian in 257-58. On August 3rd, a two-week long cycle of feasts associated with St Lawrence begins with the Finding of St. Stephen’s Body, a feast of the universal calendar of the Roman Rite until 1960. The body of St Stephen was discovered in the year 415, along with those of Gamaliel, his son Abibo, and Nicodemus, when Gamaliel appeared to Lucian, a priest of Jerusalem, and revealed the place of their collective burial. Relics of Stephen were brought to many places throughout the world; in the final book of The City of God, St Augustine describes a number of miracles that took place when a part of them came to Africa, including the raising from the dead of six people. Another portion of them was brought to Rome in the reign of Pope Pelagius II (579-90), who placed them in the basilica of St. Lawrence outside-the-Walls; the Golden Legend tells the story that when the Pope went to lay them in Lawrence’s tomb, the Roman martyr moved to one side to make room for his fellow Levite. The early 13th-century porch still has extensive remains of original frescoes of that period, illustrating the history of the two great deacon martyrs; sadly, these were already in poor condition when the church was hit with a bomb during World War II, damaging them further. On August 6th occurs the feast of St Sixtus II, who was martyred at the catacomb of Callixtus, along with six of the seven deacons of the church of Rome, the seventh being Lawrence. When the edict of persecution was issued by the Emperor Valerian in the year 257, the holy Pope ordered Lawrence to distribute all of the wealth of the church to the poor of the city. Having done so, Lawrence then saw Sixtus being led to martyrdom and, as told by St Ambrose, addressed him thus: “Whither goest thou without thy son, father? Whither, holy priest, dost thou hasten without thy deacon? Never wast thou want to offer sacrifice without thy minister. What then hath displeased thee in me, father? Hast thou found me ignoble? Make proof surely whether thou didst choose a worthy minister. Dost thou deny a share in thy blood to one to whom thou didst entrust the consecration of the Lord’s blood, and a share in the celebration of the sacraments?... Abraham offered his son, Peter sent Stephen before him…” To this Sixtus replied, “I do not leave or abandon thee, son, but greater contests await thee. We, as elder men, receive the way of an easier combat; a more glorious triumph against the tyrant awaiteth thee as a younger man. Soon shalt thou come after, cease weeping; after three days shalt thou follow me, as levite followeth priest.” (These words from the 39th chapter of St. Ambrose’s De Officiis form the basis of several antiphons and responsories in the office of Saint Lawrence.) Sixtus and his deacons were then beheaded by Roman soldiers. 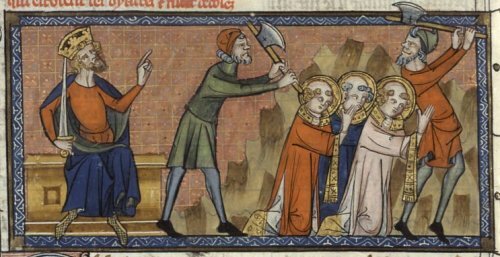 The martyrdom of St. Sixtus and his deacons, from a 14th century manuscript of the lives of the saints. 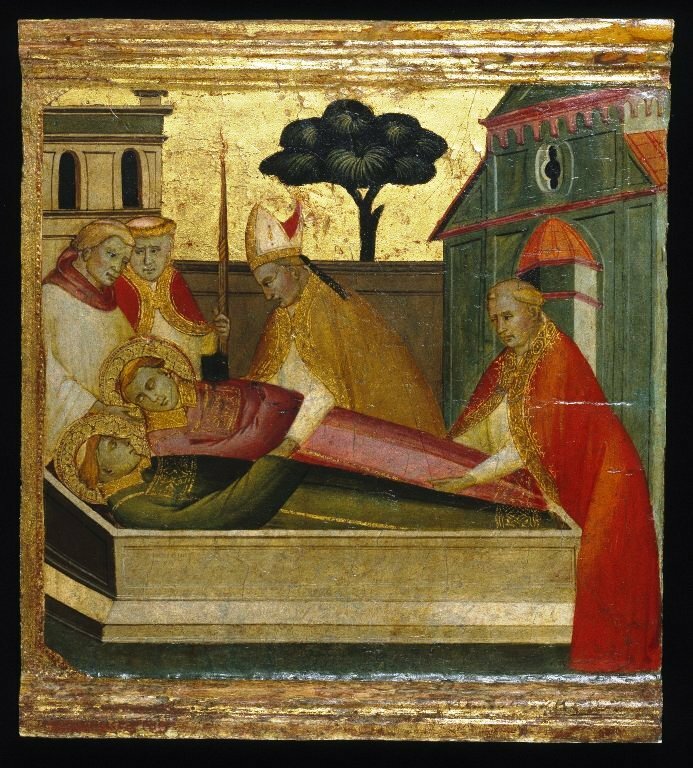 St Sixtus is named in the traditional canon of the Mass, immediately after the first three successors of St Peter, followed by two contemporary bishops also martyred under Valerian, Pope Cornelius and St Cyprian of Carthage; St Lawrence is then named first among the non-bishops. 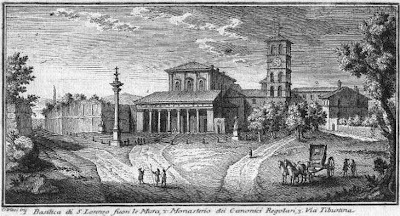 A Roman station church near the Lateran is named for Sixtus; it was entrusted to Dominican nuns within the lifetime of St Dominic, who died on his feast day. (The church attached to the Dominicans’ Roman University of St Thomas, also called the Angelicum, is dedicated to both Sixtus and Dominic.) After their founder was canonized in 1234, the Order of Preachers kept his feast on the 5th of August, rather than the day of his death, in deference to the much older feast; this remained their custom until the reforms of the later 16th century, when he was moved back a day to make way for Our Lady of the Snows. Likewise, when Pope Callixtus III instituted the feast of the Transfiguration in 1456, assigning it to the sixth of August, many churches simply ignored it because the day was already occupied by St Sixtus. 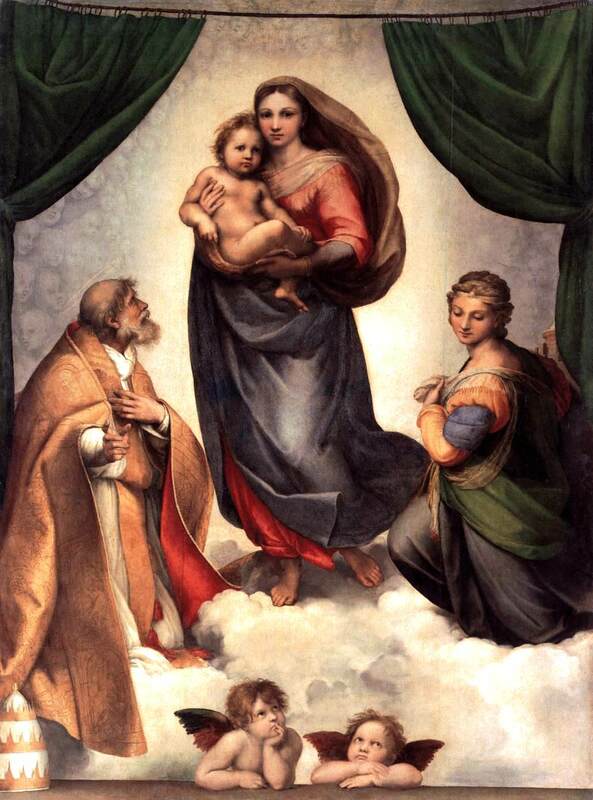 The Madonna and Child with Ss Sixtus II and Barbara, generally known as “the Sistine Madonna”, by Raphael Sanzio, 1513-14; commissioned for the monastery of San Sisto in Piacenza, which had relics of both Saints. The ninth of August, the vigil of St Lawrence, was formerly also kept as the feast of St Romanus, which was reduced to a commemoration in the Tridentine reform. He was said to have been a soldier converted to Christ by the preaching of Lawrence, who baptized him while in jail awaiting execution; Romanus was beheaded at the orders of the Emperor the day before Lawrence was killed. And Decius said to the blessed Lawrence: Sacrifice to the gods. And he answered, “I offer myself as a sacrifice to God, unto the odor of sweetness, for a contrite spirit is a sacrifice to God.” But the executioners pressed on in adding the coals, and placing them under the grill… . The blessed Lawrence said, “Learn, wretched Valerian, how great is the might of my Lord, for thy coals bring me refreshment, but to thee eternal torment; for he knows that I denied not his holy name when accused, I confessed Christ when asked, I gave thanks while being roasted.” … And all those present began to marvel, since Decius had commanded him to be roasted alive. But with a most comely countenance he said, “I give thee thanks, Lord Jesus Christ, who hast deigned to strengthen me.” And lifting up his eyes to Valerian, he said, “Behold wretched man, thou hast roasted one side; turn me over, and eat.” Then giving thanks to the Lord, he said, “I give thee thanks, Lord Jesus Christ, because I have merited to enter thy gates.” And saying this he gave up his spirit. 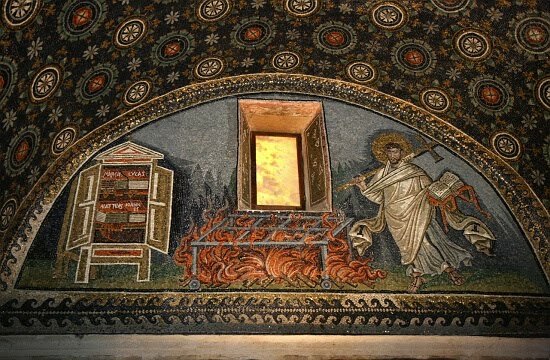 Saint Lawrence, in the Mausoleum of Galla Placidia at Ravenna, ca. 450. The armoire on the left contains four books labelled with the names of the four Evangelists, a reference to the custom of keeping liturgical books locked in the sacristy in an era when any book was an expensive rarity. The deacon would process to the sacristy when it was time for the Gospel, receive the book from a porter, and process it out, a custom still found in the traditional Ambrosian liturgy. The thirteenth of August is the feast of St. Hippolytus, an officer of the guards in the prison where St Lawrence was held, and also converted by him to Christianity. In the Breviary of 1529, he is said to have taken the body of Lawrence for burial; reproved for this by the Emperor, and threatened with torture and death, he answered “May I merit to be a likeness of the blessed martyr Lawrence, whom you have dared to name with your polluted mouth.” After torture, he was killed by being torn apart by wild horses. The story is normally dismissed as a fabrication by modern scholars on the grounds that this manner of death, reported by the poet Prudentius, is the same as that of the Greek mythological character Hippolytus, the son of Theseus who was dragged to death by the horses of his chariot. It seems not to have occurred to any of the modern skeptics that the persecutors might have been inspired by his name to choose this manner of killing him in imitation of the mythological story. It is certainly true, however, that there is much confusion about Hippolytus’ history; when Pope St Damasus I (366-84) placed an epitaph upon his tomb recounting his martyrdom, he stated that he himself “relied on purely oral tradition, which he does not guarantee: ‘Damasus tells these things which he has heard; it is Christ who maketh proof of them.’ ” (Loeb Classical Library, The Poems of Prudentius, p. 304, footnote) Prudentius also attests that he personally was healed of various ailments more than once while praying at Hippolytus’ tomb. In the Communicantes of the traditional Ambrosian canon, Sixtus, Lawrence and Hippolytus are named (in that order) immediately after the twelve Apostles, indicating how great the devotion to them was in the see of Milan in antiquity. The Saint Hippolytus triptych by Dietric Bouts the Elder, ca. 1470.